I'm a minimalist through and through and when it comes to stationery I like to keep things classic. There are two places I turn to to get my fix - MUJI and The Fox and Star. 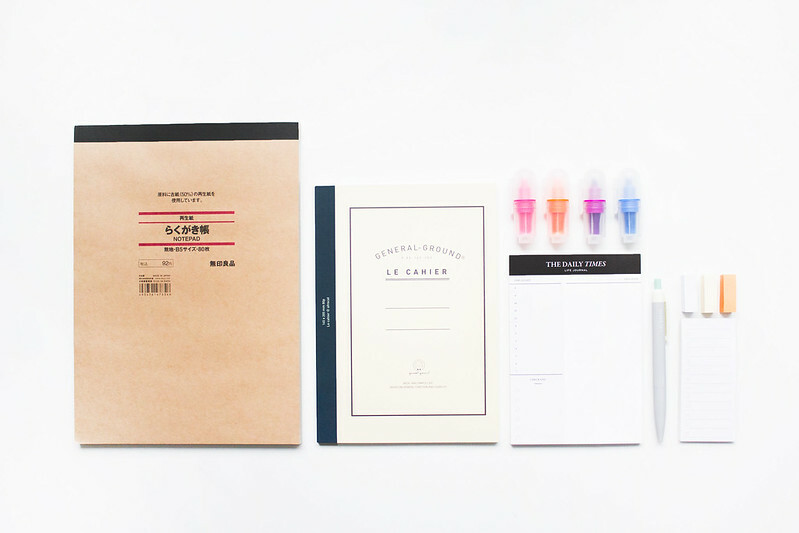 MUJI has a range of incredibly minimal notepads that keeps things simple and chic. I keep jotter pads on both my office and studio desks for scribbling ideas, rough sketches, and notes to self, and two simple black A5 notebooks to keep track of anything and everything to do with work and the blog. Their range of office accessories are neat, minimal in design, and high quality, which is why they litter my desk. The Fox and Star is a reseller of stationery from a range of brands including my favourites: Livework, Seeso, and Paperways. While I do the majority of my planning online via digital calendars and apps, I find writing things down is a better way of committing them to memory. A desk planner is something I always keep to hand to remind me of the most important tasks for the day and I keep a classic school style notebook for more personal entries. I need to invest in some nice stationary.... Queen of post it's (stuck in weird places) over here. I love Muji as well, but I don't have a lot of products from them because the nearest store in our area is about 2 hours far from here. It's hard to replenish my stationary supplies if I can't get to a store as soon as I need to. I din't know about any of these shops you've mentioned. I really like the weekly planners from The Fox and Star!! I love that desk planner and have had my eye on their Weekly Times one for a while now. Think it's time I made a purchase! gawdddd I love your taste in stationery!!! I love stationary more since getting later into my 20s bizarrely! I love a good paper diary in my bag and for work a great big diary for accounts and orders etc. Though next year's diary waiting in the wings is far from minimalist, it's a new one I've found called a dodo pad and I love it already!! I have a stationary obsession! I definitely have to check out Muji! Muji is great for clean, simple stationery! I'm not usually a paper person, I prefer digital notes, but keeping a notebook for ideas is fantastic! Absolutely - they do stationery perfectly! It used to be the same for me too - I lived in a tiny village and the closest Muji was in London (two and a half hours away) so it's nice being able to pop into the city centre and buy from Muji now I've moved to Birmingham! Haha, I have little slips of paper I keep notes jotted down on so I feel you! I make sure I fill up each notebook as I buy them otherwise I get overrun with stationery! Yup, it's super affordable! and it looks amazing. Hi. Just found your blog on Bloglovin' and and I love your photographs. Stationary is my weakness and the only thing I hoard. I love Muji too and used this planner for 2014: http://www.muji.eu/pages/online.asp?Sec=12&Sub=51&PID=7332. I love the paper in the planner. You should definitely consider the Staedtler Fine Liner Pens. I use them constantly, and they're amazing! The writing is super smooth, and the colors are very vibrant. And despite the fact that they're marker pens, they don't bleed through paper. But it's great to know others have a stationary obsession too. Now I know I'm not alone. Also, a little random, but I love how everything is perfectly placed and so light in your picture. It's hard to get pictures with natural light during the colder months, because you can never see the sun. I wish Muji would hurry up and get to Australia! I love stationary, and I love this post!!!! !